If all animals vanished, most bacteria would still live on, but if all bacteria disappeared, we would die quickly. Cells are the atoms of life, and life is what cells do. In the above post we were tracing our heritage back to chimps and gorillas. Is it a bridge too far to take your heritage back to a rock? Okay perhaps, but strange as it may seem, there are similarities between you and a rock…. A rock is made of oxygen, carbon. nitrogen, iron and calcium, and so are you. What is it that clearly occupies this middle ground between geology and biology, between the organic and the inorganic? Minerals! If you break open a rock what do you find? Minerals. What is your body made of? Minerals. From shells to teeth and bones, mineralogy contributes to life while life contributes to mineralogy. An active biosphere is one that is constantly demonstrating give and take between its participants, and mineralogy is the overlapping link between the animate and inanimate. Geochemistry demonstrably gives rise to biochemistry. Nothing seems more lifeless than a rock. It’s inanimate. It’s the antithesis of a living thing. But we are beginning to realize that rocks played an absolutely fundamental role in the origin of life…. This is a very new set of understandings, and the more we look, the more we see that life depends on rocks, rocks depend on life. And this has been going on for four billion years. Life gathered out of the materials that were readily available — and that is to say that life arose out of the most common elements on the earth. Simply, lemons made lemonade. As the Miller-Urey experiment showed back in the 1950s, the compounds of life could have arisen very quickly on early earth, and as many meteorites demonstrate, simple amino acids and organic compounds are found in abundance within any random rock floating in space. The old school of thought of these compounds organizing into life from shallow ponds has been challenged in recent decades by the idea that deep sea hydrothermal vents (discovered in the 1970s) might have been more likely catalysts, and that itself has given way to the discovery of underwater alkaline vents, the slightly more hospitable variant of their hot cousins that were found in 2000. The unique property that water possesses is its ability to dissolve and mix compounds. Water is a soup of life… a soluble that can break down virtually any solid, given enough time or power. If “Water” were to be added to Rock, Scissors and Paper the game would be over because Water would ultimately win every time. Over time water dissolves rock, and in so doing it releases gases that alter the PH level of the body of water. At its most fundamental cellular level, life is essentially born out of the same simple processes that power a battery — alkalinity (a proton deficiency) vs. acidity (a proton surplus); that is to say, harnessing energy from an imbalance of protons (a proton flow from a reservoir of too many protons to a reservoir of too few). The oldest fossils of life go back some 3.5 billion years, though there is a strong suggestion and signature of life at 3.8, but the general consensus is that life might date back to 4 billion years or longer. As long as there is liquid water, there is a possibility of life, and as zircons — the hardy survivors or early earth — clearly indicate, there were oceans in place on earth by 4.3 billion years ago. So at some point between 4.3 billion years ago and 3.8 billion years ago — through whatever process — there emerged a first living cell, and every cell in your body is a direct descendant of that cell. You have parents, you have grandparents. You have great-grandparents. But this goes, like way, WAY back. Like a person, no cell is created out of the blue, it is created from the cell that came before it. “Omnis cellula e cellula.” Every cell in your body is a testament to and legacy of 4 billion years of life on earth. You come from ancient stock. Each and every cell that makes your body is the latest link in an unbroken chain that dates back to one-third of the age of the universe. And so does every cell in the grass of your lawn. And your pet. As far as we can tell, all life of earth shares the same DNA and emerged from the same tree of life. Plants and animals share a same common ancestry; only unlike chimps — from whom we humans diverged about 6 million years ago — plants and animals (or what would much later become plants and animals) diverged about 1.6 BILLION years ago, while both existed only at the microbial stage. Really, any understanding of life on the scale of deep time starts with two basic facts (and the one factor that connects them both). Let’s spend a moment or two to consider the first, because once that first cell arose, life, well… really… took… its… time. The mind-blowing majority of the history of life on earth was microbial. Life on earth began some 4 billion years ago, and for 85% of those 4 billion years the most advanced life on the planet was single-celled bacteria, Prokaryotes, and later Eukaryotes — our ancient and primitive single-celled ancestors. Life appeared on Earth within a few hundred million years, but for billions of years it was restricted to single celled organisms. In the 1970s our current scientific classification of the Three Domains of Life was established: Bacteria and Archaea — the two Prokaryotic (and primary) domains, which have evolved very little in 4 billion years — and Eukarya, a minor offshoot whose cells seem more closely related to Archaea than Bacteria, though conversely the mitochondria within each cell seems more closely related to Bacteria than Archaea. You are an Eukaryote. Eukarya is the domain that encompasses all complex life — all people, all plants, all animals, any and all life that is big enough for you to see (and some you can’t) comes from this small, modest and much-mutated branch. We’re an extended footnote in a thousand-page book. Eukarya represents a fraction of a fraction of the life on earth, but it represents all the life that can be seen without a microscope. Eyes, ears, limbs, backbones, hair, scales and toes — BRAINS, for that matter — bacteria and single-celled life that dominates the biosphere have none of these things; these are tools and inventions only made possible with the joining of cells into complex structures. Eukaryotes have the freedom to link together cells like a kid tossing together Legos. With Eukarya, complexity built upon complexity… in contrast to bacteria, which has spent 4 billion years essentially in a flatline. The consensus today is that Eukarya represents an unlikely merging of the two Prokaryotic types that occurred only once. Anyone of a certain age will remember those old Reeses Peanut Butter Cups commercials, speculating about the origins of the candy as two people walking on the street collide and exclaim, “Hey, you got chocolate in my peanut butter!” “Hey, you got peanut butter in my chocolate!” Pause. Taste. Both cry out, “YUM!” The analog here is that the mitochondria is that peanut butter that gave an unexpected zing to the chocolate. Given how early life on earth began, it seems a strong argument that simple life is an easy threshold to cross… considering the fact that Eukaryotic life seems to have emerged only ONCE in 4 BILLION YEARS may suggest that this may be the truly “narrow needle to thread.” Achieving complexity, then, is akin to a lottery, that played endlessly and relentlessly over two and-a-half billion years, eventually resulted in winning numbers. The sheer immensity of time eventually gives rise to the unlikely. Once in 4 billion years is a very lucky stroke, but if time is on an immense enough scale all odds eventually fall away. Really, one factor was responsible for the possibility of complex life, and that factor was oxygen. It is only in this last 15% of life’s history on earth (600 million years) that significant multicellular life has arisen, and a freakish abundance of oxygen seems to have produced the fuel for driving complexity. 90% (NINETY percent!) of the history of life on earth was confined to the oceans alone. For nine-tenths of the earth’s history, life was — by definition — a water event. Even today, there are life forms that can exist in the absence of oxygen… there are life forms that can exist without sunlight… but importantly, there are no life forms on earth that can exist without water. WATER is the common solvent, water is the necessary cocktail-mixer through which all life on earth flows. Life began, thrived and perpetuated for more than 4 billion years in the protective alchemy of the oceans. The continents went unused for 4 billion years; barren and lifeless granite wastelands, untouched real estate for nine-tenths of earth’s existence. And it’s not just that the land was simply without advantage, land was an impediment, a barrier… the environment out of the water was actively hostile to life. Unlike today, the early earth (the earth of the Hadean era and Archean era) did not possess an ozone layer to permit life outside of the water. Simply, ultraviolet radiation would have cooked anything outside of the protective haven of the water. And when I tell you what created the ozone layer you’re going to get a sense of deja vu, because really, one factor was responsible for the emergence of the ozone layer, and that factor was oxygen. Oxygen was the catalyst that allowed life to overcome both of the two hurdles listed above. It was oxygen that allowed for the development of complexity, and it was oxygen that allowed life to flourish on land. So where did all of this oxygen come from? Well, in a carefully choreographed dance it came from life. The oxygen that changed the way we live was created by life itself. Life — and the conditions that foster life — are essentially a positive feedback loop. We live in an oxygen-rich atmosphere today, the earth’s cocktail is a 78/21 mix of nitrogen and oxygen, but the earth of the Archean Eon — which began about 4 billion years ago, and lasted until 2.5 billion years ago — was not an earth we would recognize, even if we could survive our first breath of nitrogen, methane and carbon-dioxide. There was no significant free oxygen in the atmosphere to begin with. Oxygen may be the third most abundant element in the universe, but it is rarely found by itself — oxygen is a sticky atom and is usually found bonded with other types of atoms. The free oxygen in our atmosphere is a byproduct of life, and our ozone layer is a construction of biology. (The “triple O”s, as I call them — three oxygen atoms bonded together; and much like three guys at a party they’re content to hang together but wouldn’t hesitate to break the bond if the opportunity arose to hook up with any attractive carbon, hence the trouble with fluorocarbons a few years back.) The countless sci-fi movies that feature people breathing air on uninhabited planets are overlooking simple physics: any oxygen-rich atmosphere would be unlikely without pre-existing life. Free oxygen at any percentage over 1% is an anomaly, a suggestion of a bio-signature; and as we look out into the universe today any atmosphere containing oxygen would be a strong indication of an inhabited world. The presence of oxygen in a planetary atmosphere is the litmus test of life: water signals the potential for life, but oxygen is the sign of its fulfillment — only life can produce free oxygen in the air in any abundance. The main source of oxygen in the atmosphere is oxygenic photosynthesis, and its first appearance is sometimes referred to as the oxygen catastrophe. “Oxygenic photosynthesis seems to have been invented but once in all of earth’s long history, by precursors of the bacterial clade that we call the cyanobacteria.” (Franklin M. Harold, In Search of Cell History, p. 158) When, exactly, single-celled cyanobacteria first emerged is a little unclear in the fossil record, but what is clear is that by 3 billion years ago (if not long prior) its colonies were prospering in shallow oceans, forming mineralized structures or mattes called stromatolites. Okay, sure, bacteria, big deal… but this was bacteria that photosynthesized oxygen. Photosynthesis. In the words of Professor Brian Cox, “the task is so complex, that unlike flight or vision, which have evolved separately many times during our history, oxygenic photosynthesis has only evolved once.” (Wonders of Life, Ep.5, BBC, 2013) What made cyanobacteria such a game changer was that in finding a way to utilize photosynthesis as a metabolic process it unleashed as a byproduct… oxygen. In school one infers (somewhat erroneously) that plants create oxygen, but really, the only place oxygen atoms are created is within the fusion processes of stars — what plants do is release oxygen. Plants take in carbon dioxide. What is carbon dioxide? It’s CO2 — one carbon atom bonded with two oxygen atoms. Plants utilize the carbon atom but simply discard the oxygen atoms. Plants free oxygen. Multiply this effect by the trillions over millennia, and you have the makings of a world-changing atmospheric event. Simply, cyanobacteria seems to have overwhelmed the biosphere. Over a span of hundreds of millions of years, countless colonies and countless generations of this blue-green algae released into the atmosphere then-toxic (to other life forms) amounts of free oxygen. Oxygen rusted the oceans, rusted the sea floor, and when no other place was left to go, contaminated the atmosphere. A 2007 NASA study suggests the tipping point to have been about 2.5 billion years ago. Simply, any competing anaerobic organisms (methanogenic Archaea) that metabolized methane would have found oxygen toxic, seen their numbers and habitats dwindle and eventually faced extinction. It was basically a “metabolic format war,” as unfathomable generations of a cyanobacteria overpopulation polluted the biosphere of the earth over trillions of generations. What resulted from this process was an earth atmosphere rich in oxygen… and ultimately rich enough that an ozone layer formed, making it possible, for the first time, for life to leave the water. “The rise in atmospheric oxygen was far from uniform [over time],” as Franklin Harold observed (In Search of Cell History, p. 158). “There seem to have been at least two discrete steps, the first around 2.45 billion years ago and a second right at the beginning of the Phanerozoic, 540 million years ago.” In short: “Atmospheric oxygen attained its present level just in time to support animal evolution.” So, while complex life may have taken a long time in the record to appear, there’s a good argument to be made that it may have occurred at the earliest possible opportunity. 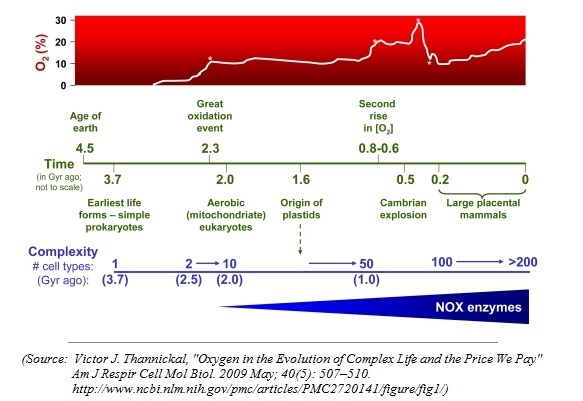 Multiple lines of evidence from evolutionary biology, geochemistry, and systems biology build a compelling case for a central role of O2 in the evolution of complex multicellular life on earth. There’s a sign at the water treatment facility which I pass every day proclaiming, “Water is Life.” I can’t help but think of the greater truth of it every time I see it. It is somewhat humbling to realize that it is only in the most recent 10% of life’s history that organisms have colonized land. And in essence, we never fully left the water… we are water-based life, and as such, we are still tied to the water — we simply evolved to carry it with us. This is why your body is made mostly of water, and this is why you’d die faster from dehydration than from hunger. We are essentially walking, talking water balloons, and water balloons that require refilling every day… that’s what you do every time you go to the refrigerator and grab a Zima. Hey, do they still make Zimas? What about Snapple? Well, anytime you feel the need to grab a soda or a juice, you’re just paying the price for the evolutionary bargain that our distant ancestors struck 400 million years ago as they left life’s native habitat. As to our friends and relatives, the cyanobacteria, they still exist today, in smaller numbers. 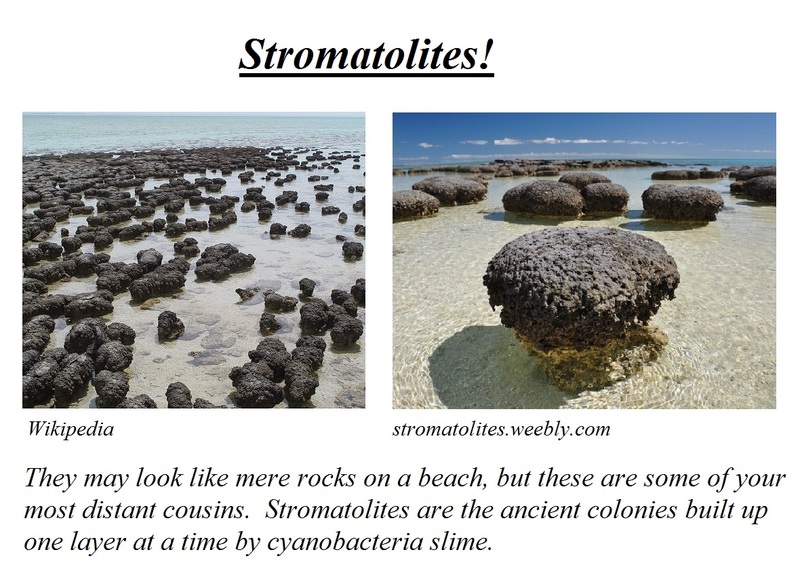 Stromatolites, the mineralized rock-like physical products their colonies leave behind, dot shorelines in remote locations of South Africa and Australia. Cyanobacteria — single-celled blue-green algae — once dominated the biosphere and changed the world with its waste. It unintentionally exterminated much of its metabolic competition and fathered the dynasty of life that still stands today. In the words of Neil DeGrasse Tyson, “you can argue that they [cyanobacteria] were the most disruptive creature ever to live on the face of the earth.” (StarTalk, ep. 2.10, National Geographic, 2015) Simply, our entire domain of life today — every plant and animal on earth right now — owes its existence to cyanobacteria and the Oxygenation Event, an environmental catastrophe in which single-celled bacteria terraformed the earth. All of this, [our biosphere today exists] because of a waste product pumped out by microscopic bacterial slime, operating on an industrial scale in those ancient seas. The empire of the stromatolites was, without doubt, the greatest in the history of the earth. Forget the Romans, the Persians, even the dinosaurs. These humble bacterial mounds dominated the planet for over 2,000-million years, and they engineered its greatest transformation.